#ThatBusinessShow takes off with week 25 today. The show, airing weekdays at 8am on 1250WHNZ and available all across the planet at http://www.tampabayradio.com or via the iHeart radio app on your smartphone, has re-defined what a radio show should be. By talking with business professionals and community leaders each morning, the show has developed an audience seeking a positive message, differing from the political and negative news talk that dominates our airwaves. Help support the show by supporting guests and sponsors and letting them know you heard them on the radio – visit http://www.tampabayradio.com and click on preferred providers and guest network to review all of our many past guests! Follow me on twitter @Jamie_meloni and keep up to date on show developments and guests at http://www.facebook.com/thatbusinessshow too! My first guest today was Dr. Johanna Turner. Dr. Turner is a chiropractor and was in studio today to talk about her practice and dispel some of the common myths surrounding chiropractic treatment. Dr. Palmer is a graduate of Palmer College of Chiropractic and has been in practice for 4 years. Her current practice is based in Clearwater at the Hartley Chiropractic Center located at 2653 Ulmerton and she can be reached at 727-623-0992 to schedule an appointment. 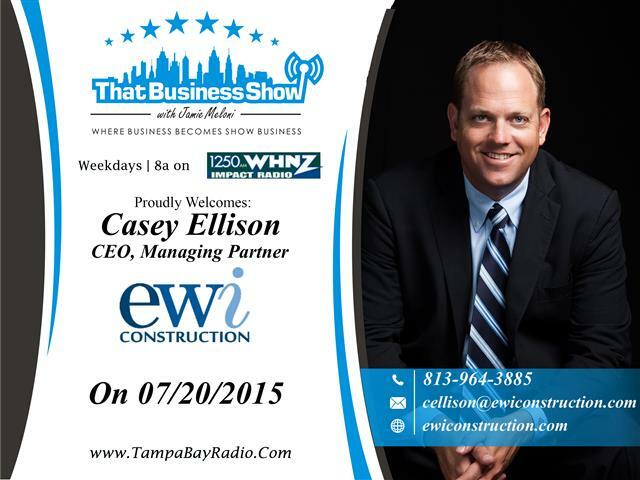 On the second half of the show, I welcomed Casey Ellison, CEO and Managing Partner with EWI Construction. This Tampa based development firm was founded in 2007 by Casey after his departure from Beck where he had worked for 13 years. Seeing a need in the marketplace for a mid-size developer, EWI was launched for that reason and to give his customers high quality construction services and standards. Since 2007, EWI Construction has been involved in countless developments including the restoration of the Oxford Exchange, BayCare Medical Facility and Whiskey Joes Barefoot Bar. EWI Construction won the Contractor of the Year Award in 2012 from AIA and their work on the Oxford Exchange earned them the Florida Trust for Historic Preservation Award in 2013. Casey shares his views on the Tampa Bay area commercial market and is excited to be actively involved in many projects in the area. Learn more about Casey and EWI Construction at http://www.ewiconstruction.com and contact them at 813-964-3885 for more information on your next development! Show Recap – Tenant in Foreclosure Law Talk and How To Get an Associates Degree from ITT in High School! 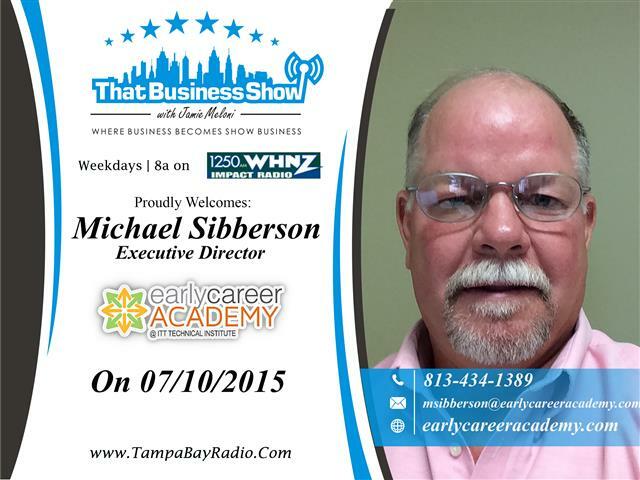 #ThatBusinessShow ends week 23 on another great show today. The show which airs weekdays at 8am on 1250WHNZ can be heard On Demand all over the web including iTunes by searching for That Business Show as well as on my YouTube Channel here – https://www.youtube.com/user/jamiemeloni Also please visit http://www.tampabayradio.com where all shows are available On Demand and you can review all prior guests via the Guest Network tab on the Home Page. Kicking off the show was Adria Jensen. Adria is an Attorney with Shumaker, Loop & Kendrick, LLP, and her focus is general business and real estate litigation including contract disputes, landlord/tenant law and creditors’ rights. Adria joined me on the phone line this morning to talk about the recent passing of Florida Statute 83.561 “Termination of Rental Agreement Upon Foreclosure”. This law which was signed into law on June 2, 2015 is designed to give tenants some degree of protection following the sun setting of the National Protecting Tenants in Foreclosure Act which expired at the end of 2014 without renewal. Adria goes into depth on some of the provisions of this new law, one of which dictates that tenants inside a foreclosed property now have 30 days to remain in the property which begins after receiving written notice from the new owner of their intent to terminate the tenant’s occupancy. The new owners do not assumer the textbook definition of landlord and may move to evict said tenant after the expiration of the 30 day notice if they fail to vacate. Adria also touches on transient situations of which Florida Statute 82.045 addressed on its passage on June 2, 2015 and effective as of this past July 1st. The law which strengthened owners rights when they are victims of illegal occupancies by transients (squatters), gives them the ability to have them removed without going through a civil action given they have provided a sworn affidavit to law enforcement. Landlord/Tenant law is a bumpy road with many facets and Adria Jensen is well versed in this area of Law. 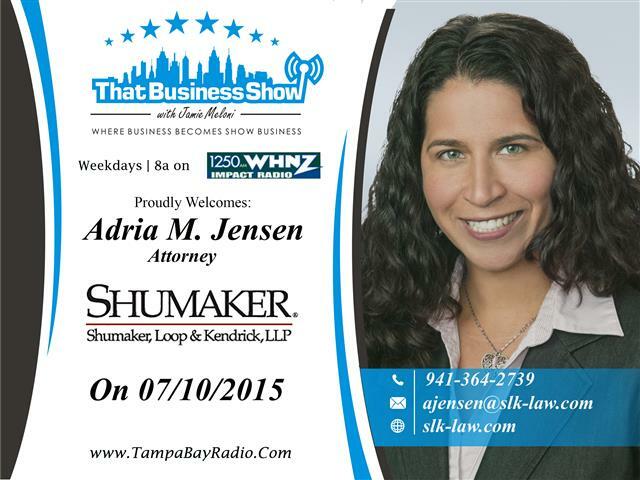 If you are in need of assistance with a property dispute or other area of Real Estate, Adria is your go to Attorney – reach out to her directly at 941-364-2739 or email at ajensen@slk-law.com and learn more about their firm at http://www.slk-law.com! On the 2nd half of the show, Michael Sibberson joined the show. Michael is the Executive Director of the Early Career Academy which launches its inaugural program on August 17th of this year. Michael, who has an extensive background in educational positions including school Principal and Superintendent, recently relocated to Florida from Texas to spearhead the launch and growth of this new program. The Early Career Academy is a career focused public charter high school where Juniors and Seniors can earn an Associates Degree from ITT Technical Institute upon graduating from High School at NO COST. The program currently offers degree programs in Software Development and Network Systems Administration and the school is located at 4809 Memorial Highway in Tampa. Participants remain affiliated with their original High Schools for extra-curricular activities but spend the day at the schools location on Memorial Hwy. Registration is still open and Michael is happy to speak with or give a tour of the facility to interested parents if you reach out to him. Be sure to visit http://www.earlycareeracademy.com for more information and reach out to Michael directly at 813-434-1389 or email at msibberson@earlycareeracademy.com to learn more about the program!